Although certain liberties were taken with AJ Cronin's novel, this is nevertheless an enthralling melodrama that combines an oppressive Gothic atmosphere with some untethered Victorian bombast. 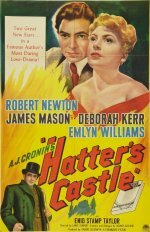 Overshadowing such stars in the making as Deborah Kerr and James Mason, Robert Newton gnaws at the exquisitely designed scenery as the Glasgow hatter who drives his family to the verge of madness in order to line his pockets and juggle his love life. Lance Comfort's direction is occasionally sensationalist, but he's wise to allow Newton his head, especially as such expert supports as Beatrice Varley, as his long-suffering wife, can more than cope with his scene-stealing histrionics.